Working is hard. You get up every morning, do your shift, endlessly repeating the same task over and over. "Geez," you think, "I need a vacation." "You can't take a vacation," your boss says. "You're a robot." Why let that stop you, though. You dream of getting away. Maybe seeing a beautiful city. In one of your rare coffee (actually, a 5W30 oil) breaks, you read about folks who take holidays to paint, sculpture and create art. "Yeah, it's time to get away," you think. "I'm going to go to London, and PAINT! Paint... IN THE SKY!" So you and seven friends book a trip from Ingolstadt, Germany to London. 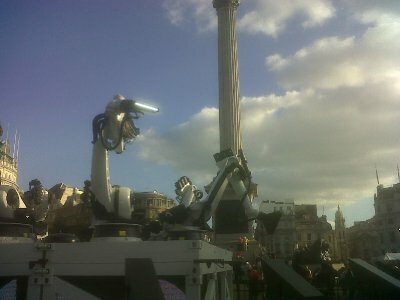 Eight industrial robots, usually used to build Audi automobiles, have been installed in Trafalgar Square by artists Clemens Weisshaar and Reed Kram. 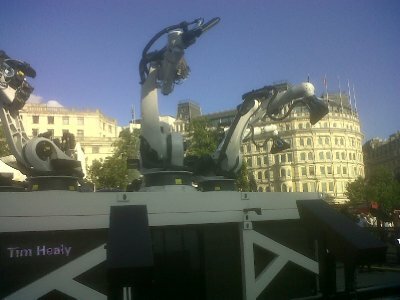 The Outrace installation, which was in place from September 16th to the 23rd as part of the London Design Festival. 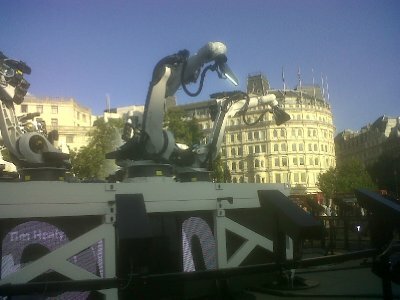 At the end of the Robot arms are a set of LED lights, which the robots use to trace letters in the air. It's not possible to see the letters when looking at the exhibit in Trafalgar Square, but thanks to slow exposure cameras to capture the lights, you can go to the website, or Youtube to see the images. Website visitors could enter a message, and if picked by the robots, they would draw it out for you and send you a link. I put in three messages, and one of them got picked to be drawn. If the robots are making the art, what are the artists to do? can be viewed at Youtube if you can't see the video above. I liked my message, and think it decent and arty. Some messages, though, are priceless, like this one submitted by Gavin Olukoju from London. Make your time, for the Robots are here!